A couple of weeks ago I shared my Turkey Blue Cheese Meatballs. The meatballs are always a hit at parties as appetizers. Since the cold weather hit though I needed a homestyle meal that put a little kick to warm us up. Hence the making of Turkey Blue Cheese Meatloaf. That night my brother and his wife were over for dinner. My brother remarked how much he disliked meatloaf as a kid and couldn’t get over the flavor in mine. Score for me. My brother is just like my father in that he is a huge critic and not big on trying new things. If you’re looking for a hearty meal that packs a punch, then look no further. You can find the recipe here. The only difference in the directions is to bake the loaf in a loaf pan. 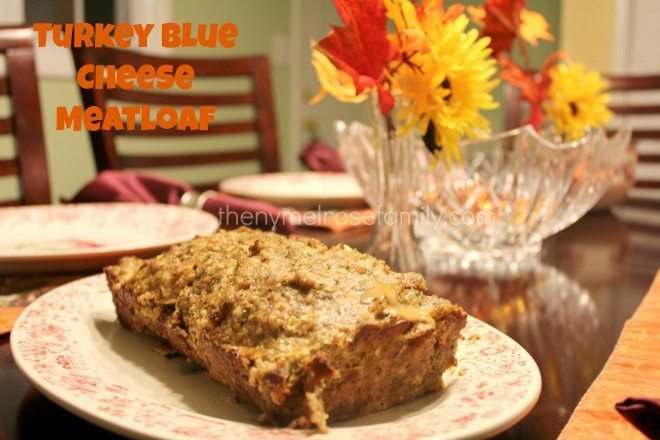 this looks yummy-i loooove bleu cheese in anything!